We move to northern California where we find this cool and serene home featuring soft tones and where designer Emilie Munroe shows that, a smart home can be a luxury reachable for everyone. We do not waste any more time and we enter this family house where we will find very special details in the decoration and distribution of the spaces. Would you like to discover them with us? When describing a house as “child friendly” it is easy to think that the decorative style has completely disappeared in favor of usability. However, a family home has to be a home for children and parents, explains the designer responsible for giving life to these spaces. For this reason, the functionality, the habitability and the warmth were the pillars of this design. In order to strike a balance between child-and-adult design and the comfort that everyone looks for in their home, the tastes of their “adult” customers should not be overshadowed by the younger members of the family. What the designer did was introduce covered storage systems and unique and fresh items into every room. The result could not be better. From the living room you can enjoy incredible views of the Marin Hills. This stay is the clear example of Munroe’s practical approach. The cushions strategically placed on the sofas offer comfortable spaces for adults and small, always welcoming. For the floor, a striped rug was chosen and the walls were decorated with black and white photographs and a box full of color. Although a palette of neutral tones dominates the space, the color of this painting and the textiles give much movement and joy to the room. This home has three bedrooms. The main one is characterized by choral and green tones that manage to design a very serene and relaxed atmosphere. On the wall of the headboard stands out a square triptych that brings a very modern touch to the bedroom in which the natural fabrics and warmth predominate. 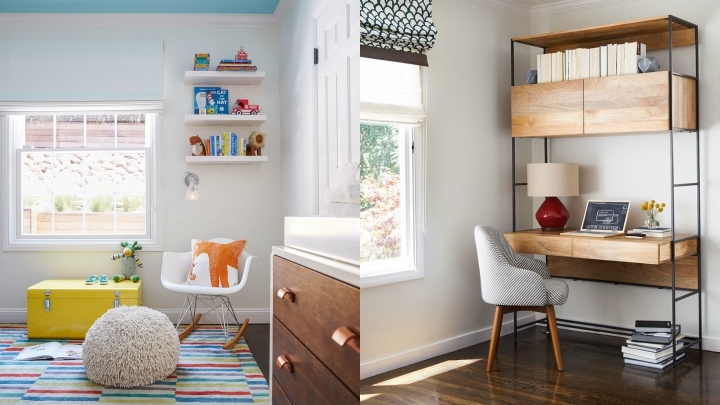 During the remodeling of this house, the eldest son already wanted his room “big boy”, while the newborn son of the couple was made with the room purely child. One of the client’s dreams was to include a play space and Munroe transformed one of the rooms into an all-in-one room : game room and guest room. Its design required strategic thinking so that everything was in place and fulfilled its mission, from the functional armchair where guests can sleep to the wonderful and personalized wallpaper with palm print that covers the walls. Throughout the rooms of both children, the miniature versions of trendy modern furniture, such as the white Panton chairs and the Eames rocker, create some of the most modern environments.